Charley Ellis may not be a household name, but he commands the respect of many savvy investors. He shook up Wall Street in 1975 with a landmark article in a financial trade journal that attacked the notion that professional money managers consistently beat the market. Nonprofessionals stand even less chance of outperforming the benchmarks, argued Ellis, so individuals need to rethink their approach to building wealth. That influential piece was the basis for Ellis’s classic investing book, Winning the Loser’s Game, the sixth edition of which is due in July. Founder of the financial consulting firm Greenwich Associates, Ellis has also served as a director of Vanguard. Today he still worries about investing costs, as well as the challenges that aging boomers face from low bond yields, uncertain stock returns, and dubious financial come-ons. Ellis, 75, spoke recently with MONEY editor-at-large Penelope Wang. Their conversation has been edited. Despite recent highs, bear markets and crises have made our readers nervous about stocks. What’s your advice for them? Ben Graham said that people pay too much attention to what the market is doing currently. And he wrote his wonderful book Security Analysis in 1934. If people look backward, they will have one set of views. As they look forward, they’ll have another. What kind of returns should people expect? Seven percent annual average returns for stocks over the next decade is the consensus among the investing pros I talk to. Minus inflation and expenses. So you’re looking at a real return of 5% or less, which is not a lot. But over time you can still do pretty well. So they should be buying stocks? They should absolutely invest in a low-cost index fund. But nonprofessionals should forget about stock picking. For an individual investor, it’s like my saying, “I’d like to play football with the NFL.” You’ve got to be kidding. You don’t recommend giving money to pros to manage either. Most active managers underperform because of fees. Some 80% of them would slightly beat the market, but after fees, their returns end up being below the market. You’ve said that people should think differently about fund costs. We’ve been describing fees in a way that really is nonsense. We ought to look at fees not in terms of assets, but as a percentage of the incremental returns of a fund — how much extra return you can expect over a comparable index fund. Think of the 7% expected long-term returns of stocks. A 1.5% fund expense ratio is a big fraction of that 7%. Now compare that with an index’s expected returns. How much more can you expect from an actively managed fund? Your fee wipes out any advantage — assuming you get those extra returns. Fees as a percentage of incremental returns are unbelievable. Let’s turn to bonds. What’s your take on them, given ultra low rates? The best piece of advice I could give long-term investors today is don’t own bonds. And if you do own them, you probably ought to move out of them. Right now the Federal Reserve is set on keeping rates down. The yield on a 10-year Treasury bond is under 2%. When yields go back to their historical average of 5.5%, an intermediate bond fund could go down 25% in value. People who are putting their retirement money into safe — quote, unquote safe — bonds can get hurt badly. So someone with half of his or her money in bonds should move it into cash? Moving entirely out of bonds into money funds or bank CDs may be too extreme for some people. But you can diversify more. You could look at foreign bonds or dividend-paying stocks, though you will be taking on more market risk than you would with CDs. Or you could perhaps stick with a short-term bond fund, which would fall less if rates were to rise. There’s no simple answer. How and when might bond investors get hurt? The Fed has enormous information about the economy, and two smart people heading it: vice chair Janet Yellen and chairman Ben Bernanke. They will just likely judge that the time has come to stop pushing rates down. They’ll look for signals like lower unemployment and higher inflation. I would expect to see rising rates in the next three, five, 10 years. 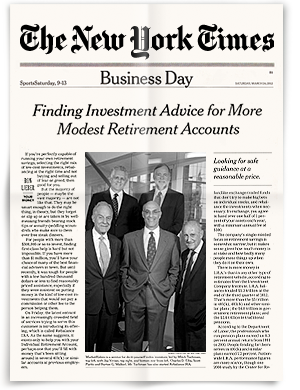 So what should pre-retirees do if they don’t know how to be invested for retirement? One thing they should beware of: Bad guys are tracking who’s getting close to retirement. And they’re targeting people with pitches — mail, email, phone calls. All this “you, you, you” stuff. The truth is, in all too many cases, people will get stuck with something that costs way too much and won’t deliver on promises. Anyone rolling over an IRA needs to be super-careful. If you hear from someone that you don’t know or someone from a firm you’ve never heard of, check them out. There are a lot of tough players out there who are selling all types of products and who don’t really worry about what happens to you. So if you’re being offered something, ask the salesperson to put the numbers in writing and ask him, “Would it be a good idea if I run this by my accountant or my lawyer?” If he doesn’t like that idea, that tells you something. It’s not just about a particular product, but also about how you buy it. Low-cost annuities are a good idea, but sales commissions often make them not that good a deal when you purchase them. You should check fees rigorously. There are usually several ways to buy anything. You also think that people should adjust their timetable for investing. For someone around the age of 60, a 30-year time horizon for investments is perfectly sensible. If you have a younger spouse, it could be even longer than that. You can change your behavior by thinking really long term. You can stop being flustered so much about daily market moves or even what the market does this year. The longer your time horizon, the more you will surely invest in equities, which will help you build financial security. With a long time horizon, you will also focus more on protecting your family — your spouse and your kids — even after you’re gone. I’d like to help my grandchildren get to college. As a percentage of assets, the fees of an actively managed fund may not seem high. Compared with a fund’s returns, though, they’re considerably more substantial — especially since active funds usually don’t outperform their benchmark indexes. Notes: Expense ratios are typical for stock funds. Examples of returns are before fees.